The Under Desk Power Pack range is made from high grade engineering plastic materials and are available in 4 power configurations. 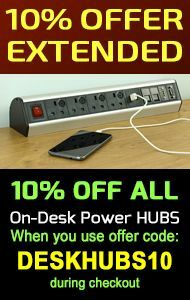 These Under Desk Power Pack units offer models which feature individually fused sockets or master fused. Also some models offer RCBO protection, all units within the range complies with BS-6396 standard. Power Start Leads and interconnectors are available in various lengths and are sold seperately. For more information please see installation Guidelines on product page.